For a movie based on a video game you play while on the toilet, you have to somewhat temper your expectations. We all know and play the game on our phones and tablets all the time. 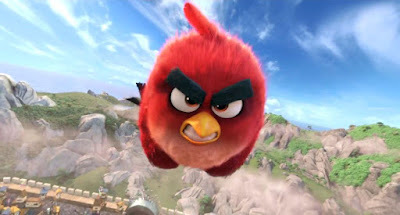 We first played Angry Birds, then all the subsequent spin-offs: Angry Birds Seasons, Angry Birds Rio, Angry Birds Friends, Angry Birds Space, Angry Birds Star Wars, Angry Birds Star Wars II, Angry Birds Go, Angry Birds Epic, Angry Birds Transformers, Angry Birds Fight, Angry Birds 2, and Angry Birds Action. Pretty much most of our phones are cluttered with endless selfies and Angry Birds games. Rovio Entertainment has crafted an empire in the mobile market, and it’s no wonder they don’t want to expand into other mediums. On TV Angry Birds Toons and Piggy Tales TV series have been watched by our kids endlessly. It’s a no brainer that it would eventually come to film. As a result, we have The Angry Birds Movie from Sony Pictures. The film centers on Red (Jason Sudeikis) who’s the “main bird” we all know from the games and he lives on Bird Island. Red is reclusive and wants nothing to do with anyone else on Bird Island. Red has a big problem with authority and anger management. After losing in “bird court” Red is ordered by the judge (Keegan-Michael Key) to attend anger management. 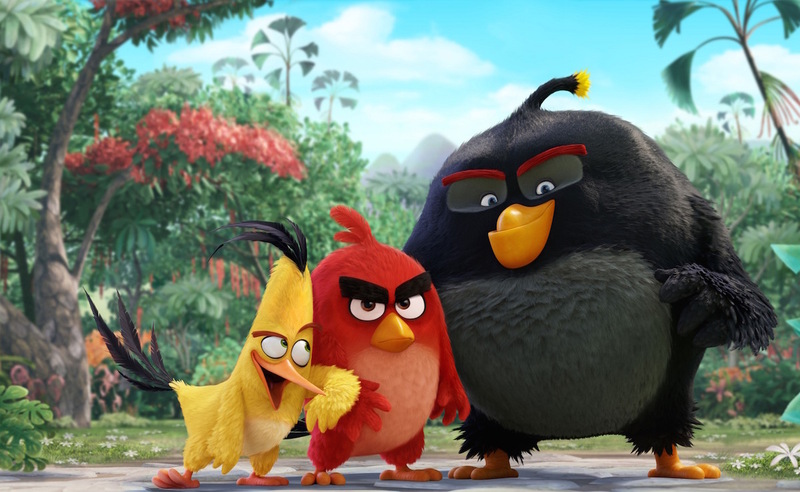 In anger management we meet some of the other birds we know all well from the video game: Chuck (Josh Gad), Bomb (Danny McBride), and Terrance (Sean Penn). The anger management class is taught by Matilda (Maya Rudolph). Fans of the video game will recognize each of these characters as birds with individual moves/powers we all strategically use, and they are well adapted to the film. Chuck is super-fast, to the point that there is even a “Quicksilver” scene reminiscent of X-Men Days of Future Past in the movie where time slows down while he performs a feat in the third act. Bomb, just like in the games exploded whenever he gets excited. Terrance, like in the games is a gigantic version of Red, but in this film, he plays more like a giant monster who’s so dangerous they don’t say out loud why he’s in anger management. You’d be surprised to know it was Sean Penn as Terrance doesn’t speak much. Fans of the video game also know about the “Bad Piggies” who show up during the film as wolves in sheep’s clothing. The main pig is Leonard (Bill Hader) and at first, show up in search of friendship, coming from their own island (“Piggy Island”). Of course, Red is the one bird not smitten by the pigs, in essence because he’s the “angry one” he can see past the BS, but of course, he is ridiculed until he’s proven right. While he’s trying to get to the bottom of the piggy problem, he, Chuck and Bomb seek out the “Mighty Eagle” (Peter Dinklage), the reverend protector of Bird Island, who does steal the show when you see the “real” him. Fans of the video game know what the Piggies are really after, so no need to go into detail here, but it ultimately leads to a rescue attempt by all the birds led by Red. Since the piggies did leave a slingshot as a gift, we get to actually see some “Angry Birds” action as they are slung across the sky into buildings. Each of the separate birds displays their powers/abilities as they attempt to save the day. The movie itself does have some great moments. Fans of the game won’t help but crack a smile when they see them being thrown by the slingshot into buildings. As like with most cartoons, the “Disneyfication” is in the film as well. 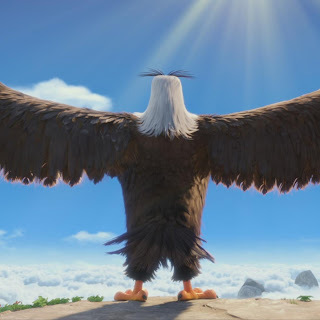 There are some jokes with slight adult humor, such as a reference to a bird with too many eggs needing “bird control.” The reveal of the Mighty Eagle was refreshing as well, as we know how mighty he is in the game in comparison to the game. The cinematography and the graphics in the film are top-notch and probably would be a delight in 3D. While most of the plot is made up for the film, it does capture the spirit of the characters from the game (if such a thing can happen) and is ultimately a better video game adaptation than most films. It’s also a surprise how many well know actors make an appearance in this film as well including Blake Shelton, Tony Hale, Tituss Burgess, Hannibal Buress, and many others. But ultimately the film is made strictly for 3-5-year-olds and often the jokes don’t land. This was a film that’s coming out probably 3 years later than it should have. The plot is rather simple, but then again it’s based on a game where your goal is to throw birds and kill pigs. Check your brain at the door and you just might have a good time.